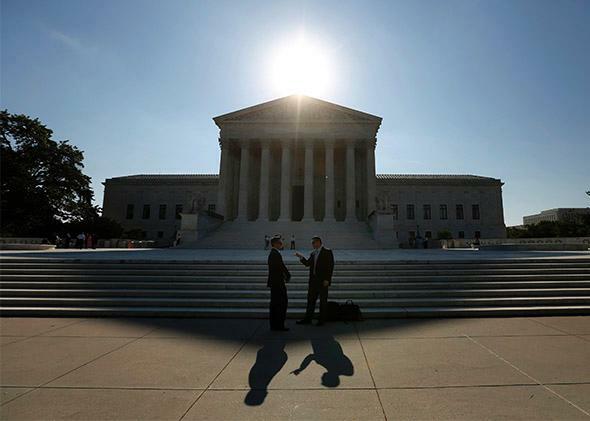 Supreme Court 2014: Unions live another day in Harris v. Quinn. Unions aren’t dead yet, but Alito is gunning for them. The Supreme Court in Washington on June 23, 2014. The Supreme Court’s conservatives didn’t kill off unions this morning. But they took a swipe that will leave labor reeling and worrying—a lot—about the next case, or the one after that. Today’s decision in Harris v. Quinn is also bad for people with disabilities and the workers who care for them at home and get paid through government programs like Medicaid. Today’s labor case is about a big question: Can unions continue to collect dues from workers who they represent through collective bargaining but who don’t want to pay their fees? (Or you can put the question this way: Can unions collect dues from a minority of workers who don’t want to join them when the majority do?) Back in 1977, in the foundational case Abood v. Detroit Board of Education, the Supreme Court approved this obligatory structure for union dues (for teachers) for two good reasons: to prevent free-riding and promote labor peace. This was all about fairly distributing the cost of recognizing a single union as the representative of a sector of workers, the court said, which Congress had earlier passed laws to support. It was all part of a package of making unions easier for governments to negotiate with and to reduce labor strife. Today, Justice Samuel Alito, speaking for the majority in a 5­–4 split along the usual ideological lines, makes it clear he doesn’t care about free-riding (or the health of unions at all). Instead, his concern is workers who don’t want to pay dues to support a cause they say they don’t believe in. It’s their objection to the union that matters, not the benefits the union has won for workers (including them). Luckily for the labor movement, the big question in Harris has a small frame. The workers who don’t want to pay union dues are of a particular sort: They are “personal assistants”—home health aides—who care for disabled people in their homes, paid for by Illinois’ Medicaid program. They started trying to organize back in the 1980s, but couldn’t because the state labor relations board didn’t recognize them as state employees. Then in 2003, the Illinois legislature passed a law recognizing the personal assistants as government workers expressly for the purpose of collective bargaining. They voted to be represented by the SEIU. And they sure did benefit, as Ian Millhiser points out in ThinkProgress: Their pay went from $7 an hour to $11.65, with an increase to $13 due this December. You will find those numbers buried in footnote No. 23 of Alito’s opinion. Of far more importance to him is 1) creating a new category of workers called “partial-public employees” who don’t have to pay union fees if they don’t want to and 2) attacking what he calls the “questionable foundations” of Abood and the whole idea of allowing unions to collect mandatory dues from any employees—public, partial-public, or private. The first part is bad for the home health aides in Illinois and the people for whom they care. If people can opt out of paying their union dues, that weakens the union, which eventually means worse terms of employment, which translates to worse service for patients. The second part of Alito’s opinion doesn’t really matter for today’s outcome, but it bodes ill for the next challenge to the way unions are funded, which surely a right-to-work, anti-union lawyer is already mounting. Alito signaled a couple of years ago, in a smaller case, that he was itching to rip up those contracts, or at least the terms underlying them. Now he has gotten in more whacks—in the name of free speech. “All they seek,” he writes of the workers who objected to paying dues to the SEIU, “is the right not to be forced to contribute to the union, with which they broadly disagree.” Once again, the First Amendment is turning out to be a powerful ax the court’s conservatives can pick up and wield against all kinds of laws and groups they don’t like, as I wrote last week. Kagan is right when she says that the outcome of Harris is “at least better than it might be.” Abood stands. But when she adds that “our precedent about precedent, fairly understood and applied, makes it impossible for this Court to reverse that decision,” I’m not sure she can make it so just by saying it. Once the conservatives have teachers or firefighters or police officers before them who say they don’t want to pay their union dues, won’t they use today’s opinion as the stepping stone for toppling Abood and mandatory dues? The rules for the Supreme Court won’t change, and they work like this: Five votes turns the impossible into the possible. One more note about the impact of today’s decision: A trio of disability rights groups (including the Judge David L. Bazelon Center for Mental Health Law, which is named for my grandfather) show in a brief for this case that collective bargaining over the conditions and terms of employment of home health aides, like the Illinois personal assistants, “has served the interests and independence of individuals with disabilities by helping to promote a stable personal assistant workforce.” The brief continues: “A ruling that declared Illinois’s arrangement unconstitutional would disserve individuals with disabilities and undermine efforts to achieve the goals of independent living.” It’s not as bad as it could be. But for people with disabilities who want to live on their own, and the workers who make that possible, it’s a real blow.